IAG, which also owns Spain's Iberia, will gain 56 more slots at Heathrow airport as part of the deal. The Unite union said it was saddened by the proposed job losses and would seek to mitigate the impact of the cuts. "Unite will be fighting to maintain as many jobs as possible and ensure that where vacancies exist people can be placed into suitable roles within BA," said national officer Oliver Richardson. The pilots' union, Balpa, said it would allocate "all the resources at its disposal" to support pilots affected by the takeover. 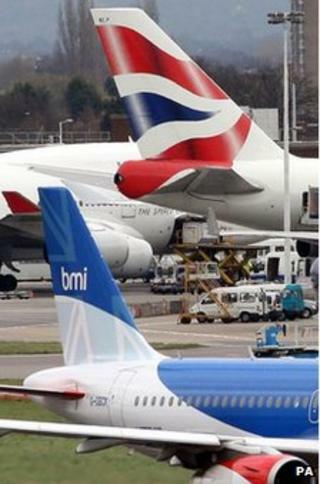 The sale of BMI to IAG was announced in December and regulatory approval was granted by the European Commission on 30 March. It has 8.5% of the landing slots at Heathrow, the UK's busiest airport.